Chequered patterns are another very interesting topic of "color-change paperfolding". The task is even more complicated, or let me put it this way, different than stripes. Folding a 2x2 or a 3x3 chequered pattern from a sheet of square is quite easy. However, the problem gets more and more difficult as the grid number increases (sticking to the paper shape and relying entirely on folding). The golden fleece of this topic is the 8x8 chessboard, which has been aimed for by a couple of origami designers throughout the past decades. Some achieved it using a single sheet of paper, some favoured a modular approach, assemblying the chessboard from four 4x4 units (in fact, most designers' learning curve included folding 4x4 and sometimes 6x6 boards before attempting the 8x8 version). Solutions also differ in an additional aspect: whether there are exposed diagonal edges (resulting in "fuzzy" fields) or these are hidden, and the result is seamless (clean fields). My experience with the subject is two-fold. First, I was always very delighted by the clever one-piece chessboard models, and felt challanged to come up with my own (this is still to come, partial results were achieved). Second, I found a nice way of folding the first non-trivial odd-number grid (clean type), that is, the 5x5 chequered pattern. The choice is not pure accident, as this pattern happens to be the national symbol of Croats (called Šahovnica), and the model was designed for the Poetry in Paper origami exhibition in Croatia (2008). 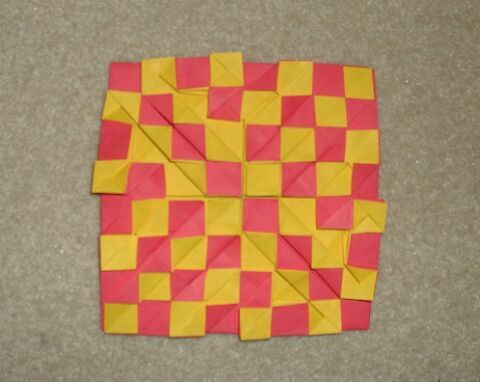 A couple of years later I discovered that Olivier Viet from France had folded a 5x5 chequered pattern (fuzzy type) that was published in 2001. I do not know details about the background of this model, however. Below you find an overview table of the chequered pattern designs known to me (only those were included which are at least 4x4). If you can help to fill in the missing information, please contact me (thanks to David Dureisseix, Andrew Hudson, Marc Kirschenbaum, Gareth Louis and John Montroll for their help in compiling this page). Note 1. "Scale factor" (SF) stands for the size ratio of the initial square's side and that of the finished model. The smaller this number is, the more efficiently we use our paper. As a rule of thumb, for larger grids the minimal SF tends to increase, and "clean face" designs require more paper than their "fuzzy" cousins. For example, according to John Montroll, the minimal SF for a standard 8x8 chessboard is 4 (clean face) and 5 (fuzzy face). Note 2. There's a chessboard folded from a 1:25 strip by Martin Wall (BOS booklet #7, pp. 13-16, 1977) and further models by Luigi Leonardi (QQM 26 - Scacchi) and Pietro Macchi (QQM 26 - Scacchi). I have no detailed information yet about the latter two. Note 3. Max Hulme's model comes with the best SF in the 4x4 league, however it does not have any extra tabs to enable the firm assembly of four units into a 8x8 board (unlike the rest in this compilation). Note 4. John Montroll's design has a unique feature: the model comes with its own stand, resulting in a real table-like appearance. Note 5. Hans Birkeland's 4-piece modular version employs the technique of Montroll's design. The author's goal was to provide a simpler version for the less skilled folders. Note 6. Gilles Hollebeke claims in a French language forum that he came up with 4x4, 6x6, 8x8 and 10x10 chequered patterns, with SF = 2, 3, 4 and 5, respectively. Note 7. The 4x4 Checkerboard by Jeremy Shafer is based on the "iso-area twist" fold. It is a unique design that shows the chequered pattern on both sides (which are complementers of each other). Note 8. Hubert Villeneuve's design has 2 fuzzy panels on each of the four pieces, but the overall appearance is closer to "clean face" solutions. Note 9. This SF is an approximate value (rounded to two decimals). More precisely, it is 27/7.